Lacoste has launched Eau de Lacoste L.12.12 French Panache, a new fragrance duo. More than a brand, Lacoste has, for over 85 years, embodied a distinctive style and attitude. An athletic figure with a bold signature that combines the worlds of sport and urban living. The very definition of elegance in motion, this legacy finds new expression in a modern and contemporary line. [...] The epitome of French "Panache". The new fragrance duo L.12.12 French Panache, inspired by the iconic Lacoste polo, captures the essence of this modernity. L.12.12 French Panache Pour Lui ~ "L.12.12 French Panache Pour Lui is a fresh aromatic oriental fragrance dreamt up by Nelly Hachem-Ruiz. It opens with all the radiance of Mandarin, Cardamom and Lemon Zest. A warm and textured accord inspired by the scent of a clay tennis court then breezes through the solar notes with the pure and authentic energy of a fruity and aromatic gust of Apple and Lavandin. Elegant and modern, it reveals itself fully in a whirl of Sandalwood, Patchouli and Narcissus." L.12.12 French Panache Pour Elle ~ "A new fruity chypre created by Sophie Labbé, L.12.12 French Panache Pour Elle blossoms with the vibrations of Bergamot, Pink Pepper and Blackcurrant. Captured between Jasmine Sambac and Essential Rose, a Pink Champagne Accord sets the heart of the fragrance sparkling. Joyful and radiant, it springs forth in a burst of Blond Wood, Musk and Patchouli." 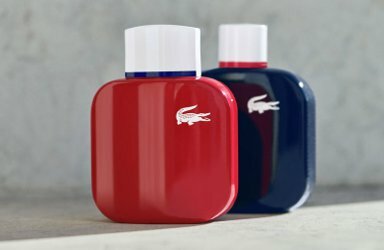 Eau de Lacoste L.12.12 French Panache Pour Lui and Pour Elle are available in 90 ml Eau de Toilette.